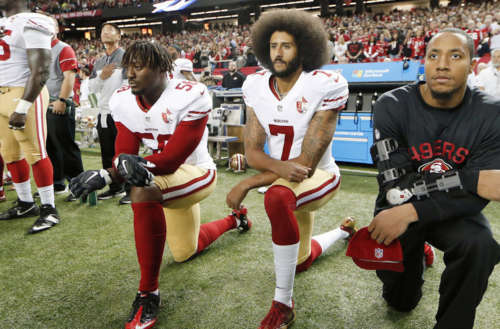 A couple weeks later, Kaepernick changed his protest to also be in support of the military, changing from sitting out the anthem to taking a knee. From there, the gesture spread throughout the NFL and the “controversy” exploded. 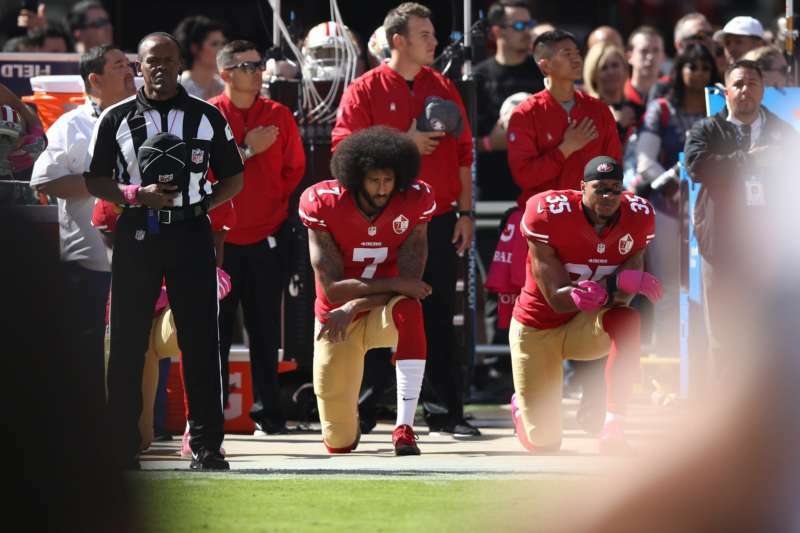 It got so bad that the following year Kaepernick was essentially blackballed from the NFL. In response to claims that Kaepernick simply wasn’t good enough to play in the league, sportswriter Jon Bois crunched the numbers and proved he was more than good enough. In response, it’s been argued that players move to raising a fist during the anthem rather than kneeling. The owner of the New York Jets has actually said he’ll pay the fines if his players choose to take a knee. 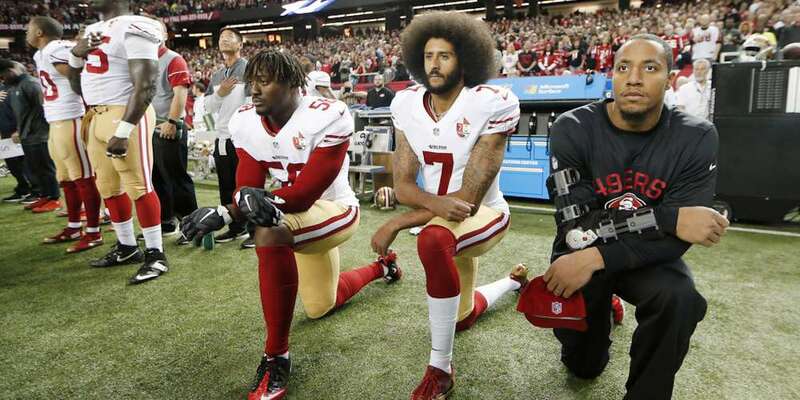 And, in response to Donald Trump and Mike Pence gloating over the new NFL kneeling ban, Colin Kaepernick’s lawyers tweeted a portion of the U.S. Code, section 227, which shows that government officials — including the president and vice president — are legally unable to attempt to influence an employment decision or practice. The Washington Redskins Football Team. For decades now the NFL has been urged to force the Washington, D.C., team to change its name given that it’s an actual slur against indigenous Americans. But NFL Commissioner Roger Goodell — the same guy behind the NFL kneeling ban — has continued to defend the name. Brain injuries. Football players are at an absurdly high risk of chronic traumatic encephalopathy (CTE), a neurodegenerative disease that results from repeated head injuries. Over 40% of retired players have shown signs of CTE, and brain injury was found in 99% of donated brains from deceased NFL players. Former New England Patriot and convicted murderer Aaron Hernandez had stage 3 CTE at the time of his suicide. Though the NFL has penalties in place for teams that don’t follow the organization’s concussion protocol, they are notoriously lax in enforcing them. Domestic Violence. This is actually linked with the previous point. Victims of CTE often experience social instability, impulsive behavior and poor judgement; football players like Hernandez and former Kansas City Chiefs running back Larry Johnson reported suicidal and violent thoughts. Regardless, there are many players who have physically abused their partners (and others) while the NFL’s response has been weak at best. A player committing an act of assault, battery, domestic violence or sexual assault will be given a suspension without pay … for six games. A second offense will result in a ban from the NFL … for a year. Homophobia. There have been multiple instances of homophobia in the NFL, and yet the organization doesn’t respond. During the NFL Combine, a week-long test for potential players, many people were asked whether they’re gay in an attempt to rattle them. The NFL publicly condemns the questions but takes no disciplinary action. When this tactic first came to light two years ago, though the NFL condemned Marquand Manuel, the coach who asked the question, a year later the league promoted him. We could go on, but our point is clear — the league has a long list of things it should address before worrying about an NFL kneeling ban. Instead the NFL is keeping its majority-black players from addressing issues affecting the black community, and that’s disgusting. 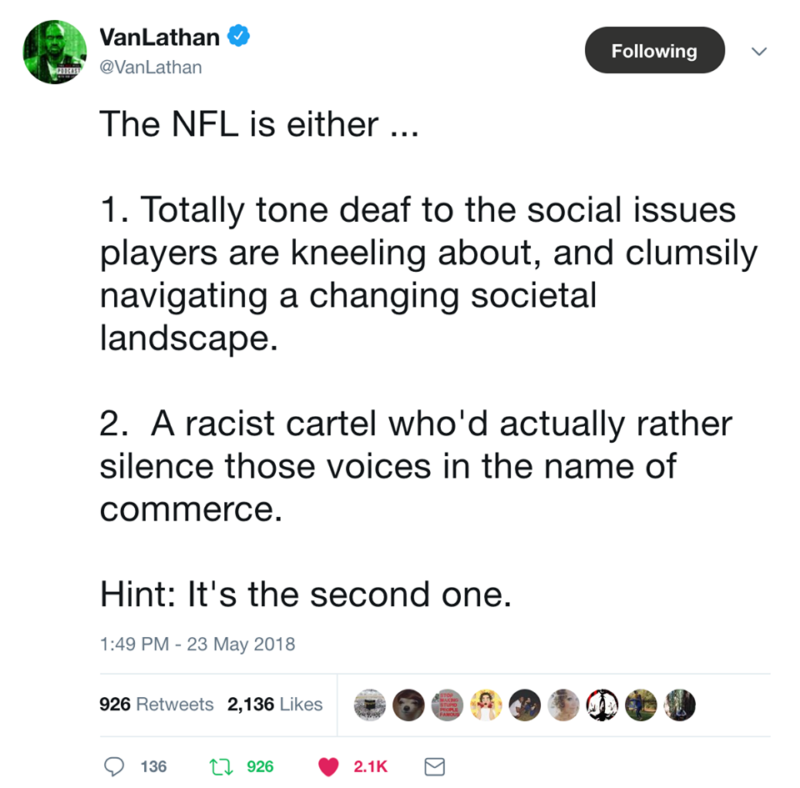 What do you think about the NFL kneeling ban? Let us know in the comments.